Financed by MNiSW on the basis of agreement no. 706/P-DUN/2018 (dated 10/05/18). Project 1: “Preparation of articles in English for eight editions of the journal Logic and Logical Philosophy over the period 2018–19; Vol. 27, No. 1–4 (2018), Vol. 28, No. 1–4 (2019)”; amount from the DUN grant: 64800 zł. 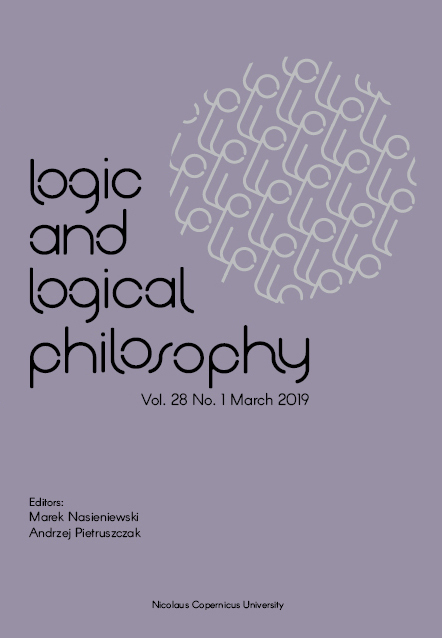 Project 4: “Digitalisation of eight editions of the journal Logic and Logical Philosophy over the period 2018-19; Vol. 27, No. 1–4 (2018), Vol. 28, No. 1–4 (2019)”; amount from the DUN grant: 18600 zł.